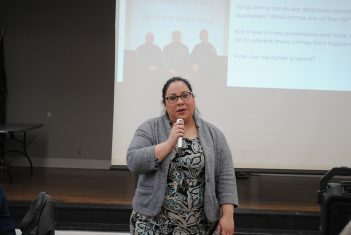 Lawrence businesses gathered March 26 for a presentation by Community Prosecutor Sharon Ely during a Business Crime Watch Meeting at the Sterrett Center. Prior to the presentation, Lawrence Police Dept. Chief David Hofmann said crime is down but businesses should still take preventive measures. Director of Crime Prevention Elia James Sanchez welcomes attendees to the March 26 Business Crime Watch Meeting in Lawrence. Hofmann said the LPD is at its maximum-budgeted strength and fully staffed but he wants to add another 10 to 15 officers. LPD has conducted business crime watch meetings in the past, but they were sparsely attended. Dozens of business owners, however, attended the March 26 meeting. Ely educated attendees on crime prevention methods, some of which were obvious, such as improving lighting and adding cameras. Other methods were less obvious, such as adding what she calls “hostile vegetation,” like thorn bushes; immediately removing graffiti; and installing fake cameras if real ones are too expensive. Ely also educated the group about target-hardening and noting ambush points. “if someone is leaving the property, whether that’s a patron or employees, and there’s a big bush, someone could be hiding there,” Ely said. Ely also suggested creating a maze-type entrance in a lobby so that a criminal can’t, as in the case of a bank, can’t make a straight run at a teller. “We are going to be asking the people involved in the crime, the victims, ‘What did you see?’ So, if they had a few extra seconds to see someone rather than (the criminal) coming straight toward them, that’s going to help us with the investigation, too,” Ely said. Ely referenced a recent case where eight individuals were robbing ATMs. A fence between the ATM and a nearby apartment complex was broken, so the criminals would hide in the apartment complex and wait for someone to make an ATM withdrawal, at which point the criminals would run through the break in the fence and rob the individual. Ely said it’s possible for business owners to call LPD and request an officer observe their business and make suggestions on how to improve crime-prevention strategy. Community Prosecutor Sharon Ely said interior considerations also are important in crime prevention. 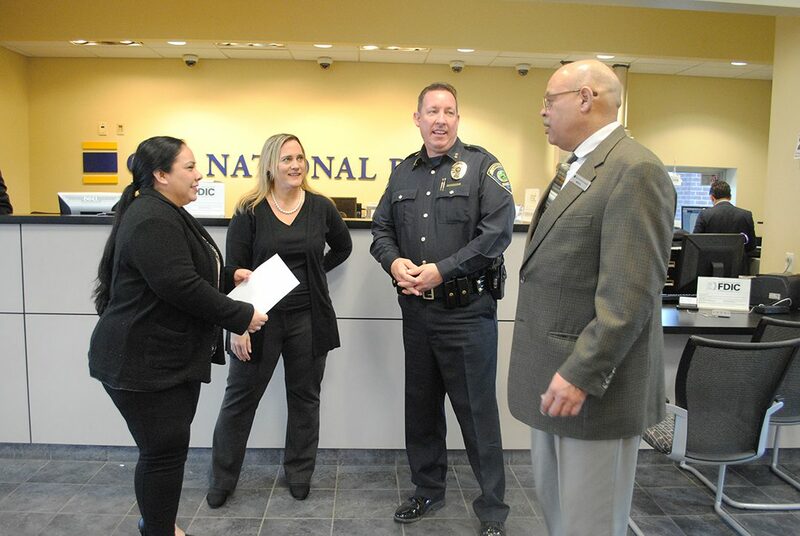 From left, LPD Director of Crime Prevention Elia James Sanchez, Community Prosecutor Sharon Ely, Chief Dave Hofmann and Branch Manager Martel Vanlandingham discuss crime prevention methods. Attendees also heard from three LPD detectives who served as liaisons with the FBI and ATF. The relationship allows LPD to solve crimes quicker. “We have that whole spectrum kind of covered. 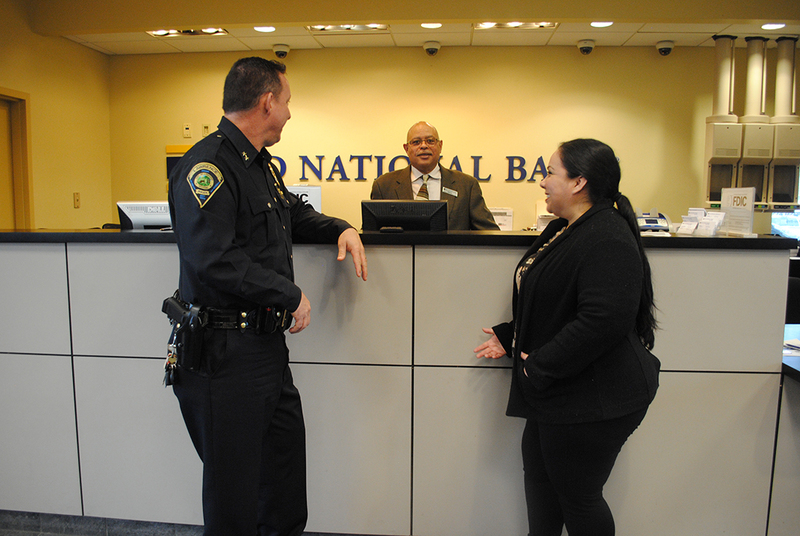 We had a robbery at Huntington Bank out in Oaklandon and that was one of those things we had assistance from (the Indianapolis Metropolitan Police Dept.) to ATF to the FBI, and we could do things we wouldn’t be able to do on our own,” LPD Det. David Gordon said. Gordon also said a lot of investigation assistance comes from businesses communicating with law enforcement when something seems wrong. “A lot of that is partnering with businesses and understanding if something feels off, you guys communicate that to us, and that gives us the opportunity to solve that crime from the get-go,” Gordon said.